Discounts or sales are always welcomed by customers of any shop, but what draws customers to the Palos Verdes Resale Thrift Shop is the welcoming atmosphere created by the volunteers who work there. And through their efforts the shop has grown financially, benefitting 13 local charities with a total of $1,013,000 since December 2005. Volunteers are actively involved in deciding the distribution of the proceeds. For every hour worked at the Lomita-based thrift shop, volunteers have a right to vote on money distribution, which keeps them "coming back week after week after week," said Marty Hunt, one of the store's longtime volunteer managers and a parishioner of St. John Fisher Church for 20 years. "What really sets us apart from other stores is that we're friendly. We talk with the customers and establish a friendly rapport that makes them want to keep coming back," she said. "For many of them it's the only place where they see a friendly face during the day and sometimes they just come to chat." 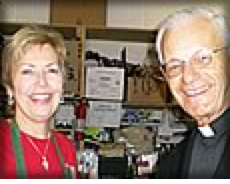 It was founder Helen Frances "Fran" Pitts, also a member of St. John Fisher, who came up with the idea of starting the thrift shop after years of supporting the National Charity League and being involved in the parish's outreach ministries. She thought of adding the component of volunteers' involvement in the decision-making. "We had volunteers from organizations such as Meels on Wheels who didn't have a way to get funding, so we gave them an opportunity to vote for their own facility," Pitts told The Tidings. The store is a "face of our church," said 61-year-old Pitts, who despite suffering corticobasal degeneration, a degenerative brain disease that is affecting her motor skills, she still provides support as a consultant. "We wanted to provide services to people who don't go to church for fear of not being treated well, and we treat them in a loving fashion," she noted. She described the transactions as a win-win situation, where "shoppers get good deals, volunteers work and help others and donors can get a tax write-off." About 90 percent of the 125 volunteers and customers are women, parishioners of St. John Fisher or from other Catholic and non-Catholic churches. Others are homeless women, single moms or recovering addicts who receive services at the same charities supported by the thrift store, "who want to give back to the community," Hunt explained to The Tidings. The inventory includes clothing (The Designers Corner and Vintage), housewares, collectibles, furniture, antiques, art, books, and jewelry. Most of the donations are made by St. John Fisher parishioners or by other affluent residents of Rancho Palos Verdes, where the church is based. "This is a great benefit for the poor," Fr. David Sork, the church pastor, told The Tidings. "The money goes to those charities that work according to Catholic moral principles that don't get big funding from other sources. "It is a great community builder, parishioners really enjoy going down there and working," said Fr. Sork. "They see it as a ministry. When people come in they treat them as they would treat Christ. It isn't just a customer or somebody coming in, they really try to model that so that people feel good when they come in there. They're hands-on." The process to apply for financial support is simple. Organizations submit papers showing their legal status and their financial statements, which are reviewed by a committee named by the board of directors. A list is provided to the volunteers on a quarterly basis when the votes are tallied. Volunteers vote for the organization of their preference as well as the amount assigned. For more hours worked volunteers have more chances to vote. Pregnancy Help Center, right to life; and Harbor Interfaith, services to needy families. The selected nonprofits receive an average of $4,000 four times a year. To date, an average of $55,000 has been handed out on a quarterly basis, for a total of $1,013,000 since December 2005. "We are doing much better than I would have ever thought," said Pitts. This year she was able to present the first endowment of $1,000 to a graduate of Bishop Montgomery High School in Torrance, as part of the $52,000 Fran Pitts scholarship fund created in December 2009 from the proceeds of the store sales. "I am so thrilled with the results because it puts us on the map on donations to charities," she continued. The community response has been a success since the store's opening in August 2005, according to Fr. Sork. Unexpectedly, the loan acquired to pay for the location and for the opening expenses was paid in full in three months, all of it out of profits from sales. Donations grow every year and very few items stay in the store for more than two weeks when prices are lowered down, according to an established sales color system indicating the date when the items were displayed for sale. When the items go unsold they are put in a "dollar sale" that takes place every other week on Thursdays, Fridays and Saturdays in the parking lot behind the shop. "We are so blessed that we get so much merchandise and are able to move it quickly," Hunt said. "The ability to be able to donate so much money to those who need help, it's kind of the foundation of what we're trying to do as a church." But the best reward, said Pitts, is the response of the community they serve. She recalled the woman owner of a nearby Thai restaurant who on various occasions has brought food for the volunteers, or the Hispanic woman who once bought a fishing pole at the store and a few days later returned to the shop with a fish she caught with the pole and that she had cooked for Pitts. Copyright 2014 Palos Verdes Resale. All rights reserved.